integrators. They perform multiple functions and must withstand varied sources of strain throughout the course of their service lives. Regular pedestrian traffic, irregular impacts and loading forces, weathering effects, and other adverse phenomena can significantly impair the performance of fencing systems engineered from conventional materials. This is complicated by the fact that traditional fencing systems can be difficult to machine and install. Architectural projects are increasingly turning to novel material solutions to reduce the installation periods of essential components and structures. Wood is one of the most enduring structural materials ever used, and it is still widely used in domestic architecture today. It has fallen out of favor in projects concerned with component longevity or stringent sustainability requirements, however, due to the substantial ongoing maintenance costs of wooden fencing systems. There are also significant upfront installation costs, as wooden fence posts and rails must be machined from the bulk material – usually off-site. These components then need to be installed by experienced personnel who can holistically alter the product if it has warped during transit. Wood expands and contracts depending upon atmospheric pressure and humidity. While this behavior can be predicted with a measure of certainty, architects must operate within wider tolerances when using wood compared to metal. Metal alloys such as aluminum and steel have become preferable for bulk fencing systems in the coastal and offshore, industrial, and transit sectors. This is due to their enhanced strength and resistivity profiles compared to wooden fencing systems. However, these materials can be expensive to profile and must be welded together on-site. Joining metal posts and handrails is a time-consuming process that often precedes one or more subsequent surface treatment methods. Fiber reinforced polymer (FRP) composites exceed conventional materials on almost every front, with improved strength-to-weight profiles and comprehensive resistance to corrosive agents. This unique material has been widely adopted to fabricate fencing systems that can withstand the strain inherent in various areas of application, while also performing from an aesthetic perspective. One of the unsung benefits of FRP fencing systems, however, is their ease of assembly. Strongwell’s SAFRAILTM and STRONGRAIL® systems are engineered in a range of standard shapes that can be manufactured in bulk and shipped for simple on-site assembly. These components include square, rounded, and channel-top handrails, various shaped end-brackets and connectors, secure corner and adjustable connectors, and much more. This allows architects to easily design complex multi-level fencing systems and order the exact components to complete installation in shorter time frames than has previously been possible. There is no need for additional profiling or welding, and components can be fitted using standard carpenter tools. Our FRP fencing systems have successfully been installed in a range of sectors, including: hotel and leisure destinations; industrial facilities; coastal attractions; and domestic architectural projects. 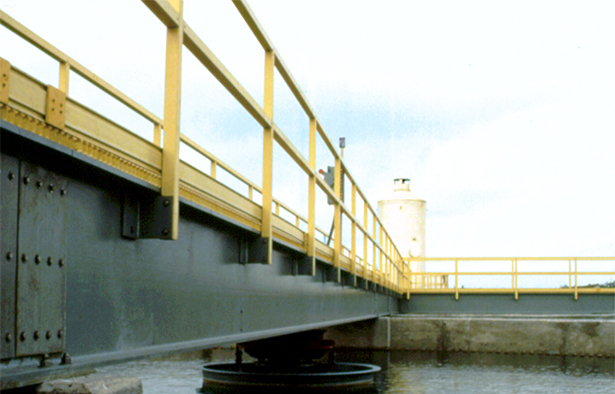 Strongwell is an institution in the development and manufacture of FRP solutions for any and every application. Our fencing systems are suitable for installation in demanding application areas, with outstanding mechanical properties and comprehensive resistance to various corrosives. If you would like any more information about our FRP fencing systems, please do not hesitate to contact us directly.